Our timber bifolding door range is like no other, combining premium materials with expert craftsmanship to produce a premium timber door that is versatile, durable and offers a stunning contemporary appearance. When the panels are closed together the sightline is minimalistic to maximise glass panel size and allow for maximum light entry. Our doors are tested thoroughly and offer maximum protection against bad weather & offer excellent stormproofing. Whether you have a traditional charming country cottage or a new build home in need of some stylish new entrance-ways, timber bi folding doors really do make a pleasing and versatile addition to any living space. This is particularly the case when used as an entrance out into gardens, decking, courtyards and other open spaces. The wooden frame creates a rustic, natural feel, while the glass window panels let in plenty of natural warmth and light. Beautiful, High Quality Timber Folding Doors with up to 16 door leafs per set. Made from natural hardwood, often manufactured in Sapele but available in other timber and oak hardwood. The frame top and bottom track consist mainly of a silver anodised aluminium extrusion with solid timber cover trims. All extremity door stiles (outermost stiles on each stack) use solid laminated timber. Standard door leaf thickness is 68mm (customisable). Standard outer frame depths from 142mm. 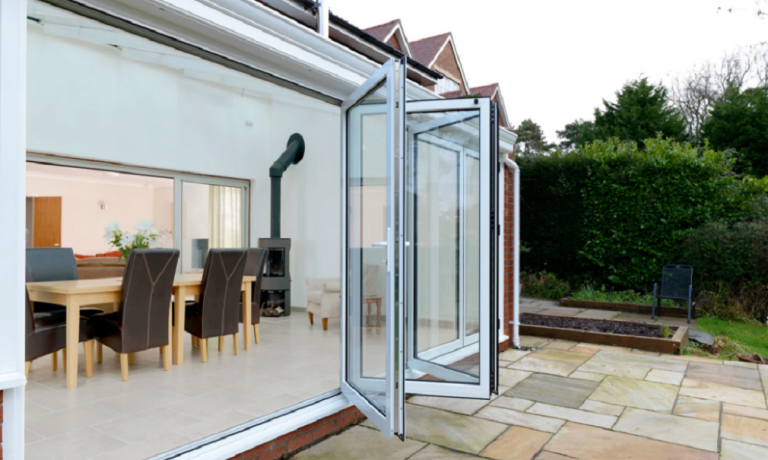 For bifold doors with windows, glass units use standard 28mm double glazed configuration. Micro-porous paint finish in any colour, we can coat to any RAL / BS and Farrow & Ball / Dulux colour. For families in rural or coastal locations who want to make the most of the surrounding views without compromising square footage in the living space, these doors are a particularly popular choice. Timber is a naturally insulating material, so it helps reduce heat loss in the colder months, and all the timber used in our doors is from sustainable sources – FSC (Forest Stewardship Council). Want to improve your home? 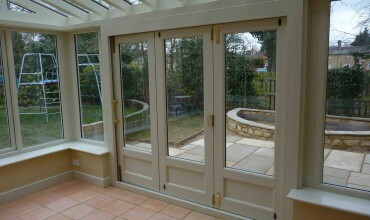 Then timber bi folding doors are an absolute must. 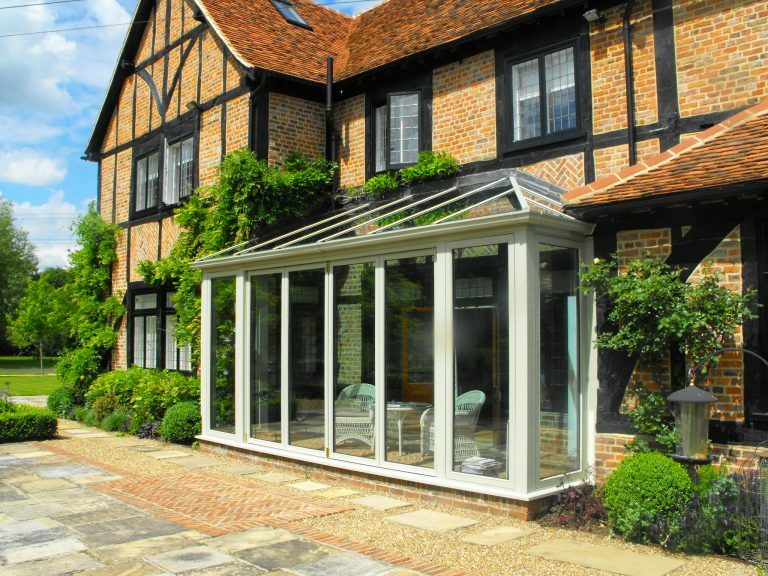 They’re a wonderful addition to anyone wanting to add a new extension – they’ll bring garden and living area together in true seamless style. With ultra-thin sight lines, there is very little on the door to obstruct your views outside. Did you know? 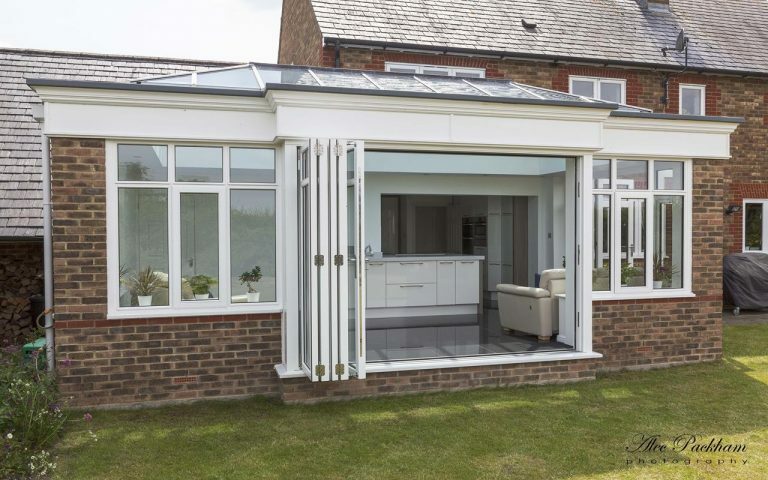 These types of doors are used broadly on many of the popular ‘make-over’ television programmes and magazines, thanks to their ability to change any living area by offering a crystal-clear opening onto your patio or straight into your garden. From white wooden bifold doors to stained brown, you’re sure to find a style you‘ll love. All the materials we choose to use in our frames are treated to ensure they have a long lifespan. This means they’re specially coated to ensure resistance against the natural elements as well as UV light to prevent fading and warping. These treatments also ensure suitability in city/urban settings as the doors are resistant to damage caused by high traffic levels and pollution. 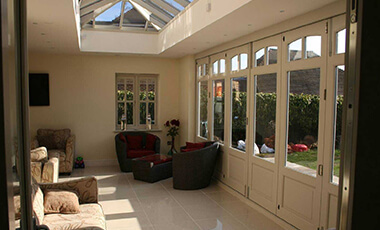 What Are the Benefits of Hardwood Bifold Doors? 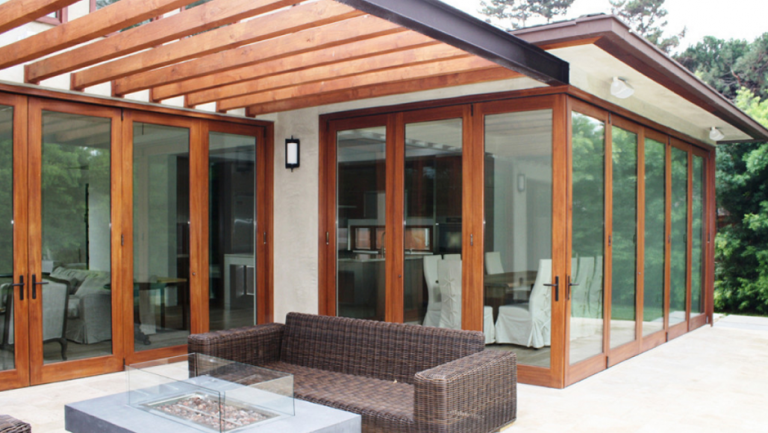 Unlike aluminium bifold doors, timber is a natural insulator to ensure optimal heat retention, which can be especially beneficial when the wooden folding doors are used in conservatories, orangeries or out onto decking or gardens. These stylish and environmentally friendly products can be stained and finished in several different paints, so whether you want a simple varnish or a colour to match your living space, you can achieve the look you want thanks to simple customisation. If you’re looking for a traditional, natural-looking door, you really can’t go wrong with timber folding doors. Complete with slim sight lines and made of robust timber, they’ll no doubt bring a touch of warmth to any room. In fact, timber bifold doors are an incredibly popular choice in coastal locations as external doors and are commonly used as internal wooden bifold doors for cordoning off the conservatory from the main household. Where Are Hardwood Bifold Doors Used? Folding timber doors are an attractive and versatile addition to any living space, whether you live in a traditional charming country cottage or new builds that are in need of a stylish new entranceway. They’re often used as an entrance out into gardens, decking, courtyards and other open spaces. Its gorgeous wooden frame adds a rustic, natural feel, while the glass window panels allow light to flood in – your room definitely won’t be short of natural light. Perhaps you live in a rural or coastal spot and want to take in the spectacular scenery without compromising square footage in the living area. In which case, these external bifold doors are a truly winning choice. 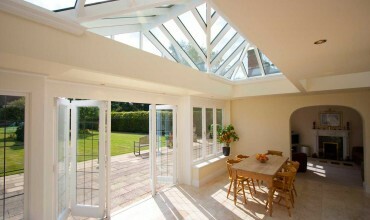 Bi-folding doors – These doors include numerous leaves that concertina back to fully open up the aperture. 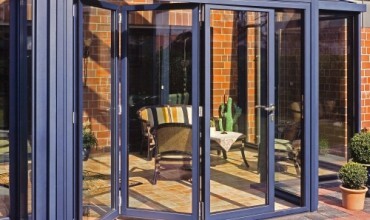 They’re often known as interior concertina folding doors or Louvre bifold doors. Folding Patio doors – Patio doors are mostly made up of two or more large panes of glass, one of which slides behind the other. French doors – Traditional patio doors are usually found in older properties; these typically include two doors which both open out into your garden or outside space. Being a naturally insulating material, timber helps decrease heat loss in the winter. What’s more, the timber used in our doors is sustainably sourced by the FSC (Forest Stewardship Council). There are two classifications of timber, hardwood and softwood. At Bi-Fold Doors UK, we only manufacture products from hardwood materials, as we find that softwoods simply aren’t strong enough to provide the longevity and premium finish deserving of our clients. Softwoods come from coniferous trees, such as pine, fir, and spruce trees. While it makes a pleasant, workable wood for use in interior applications and furnishings, it requires a great deal in the way of fortification from paints, varnishes and other finishing products to withstand the elements. Sapele is a popular African wood species that is dark red and brown in colour. This is a workable wood with a fine grain, commonly identified by its “stripy” looking finish. Oaks such as English Oak are charming and classic, defined by the warm golden-brown tones and hard, heavy timber finish. The coarse texture and straight grain requires a seasoned hand to ensure a fine and stylish finish. External solid oak bifold doors look especially chic in the home. Another attractive African wood, Idigbo is a durable, medium-weight wood that lends itself well to external applications especially. It is often used in place of oak to get the same finish for a more competitive price where budget is an issue. These are just a couple of our preferred hardwoods, chosen for their workability, durability, longevity and style. As hardwoods typically have a more pronounced grain pattern made more noticeable by the wood’s deeper shades, these woods create a premium, high-quality looking finish. Once we have shaped and finished the wood into the frame shapes, we finish them with stains to ensure they are given some extra strength and are weatherproofed. How Much do Wooden Bifold Doors Cost? Our doors are available in a range of bespoke sizes, starting at prices of £500. To learn more about our wooden bi-folding doors prices and to receive a no-obligation quote, click here to email us today. Please contact us via our online form or give us a call on 0843 886 8378. Our timber bifold doors prices start at £500. Panel costs start at £500 per panel. Doors with all the running gear and glass can start from £1300 for 2 panels, £1950 for 3 panels and so on. 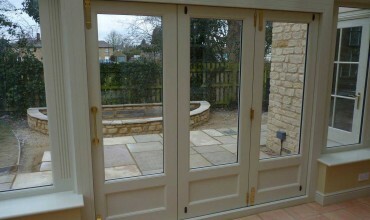 Folding patio doors in Timber vary in price. We can provide a quote over the phone or fill out our enquiry form and a member of the team will get back to you.